I love geeky subscription boxes. Heck, I love surprises in general. It’s a lot of fun to open up the box and see what magic is nestled within. 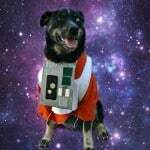 When Loot Crate contacted me about envisioning a Dream Loot Crate, my mind started searching for a good theme. They even said that someone’s dream crate was going to be made for real. Huzzah! Eric has had a bit of a bromance going for about a decade now. Every week they go on a “man date” where they usually play Star Wars X-Wing Miniatures and go to dinner. I tease him about it a little, but it’s really all in good fun. I am so glad that he has found such a great friend. In geekdom, there are quite a few of these pairings of men with a deep friendship and loyalty. 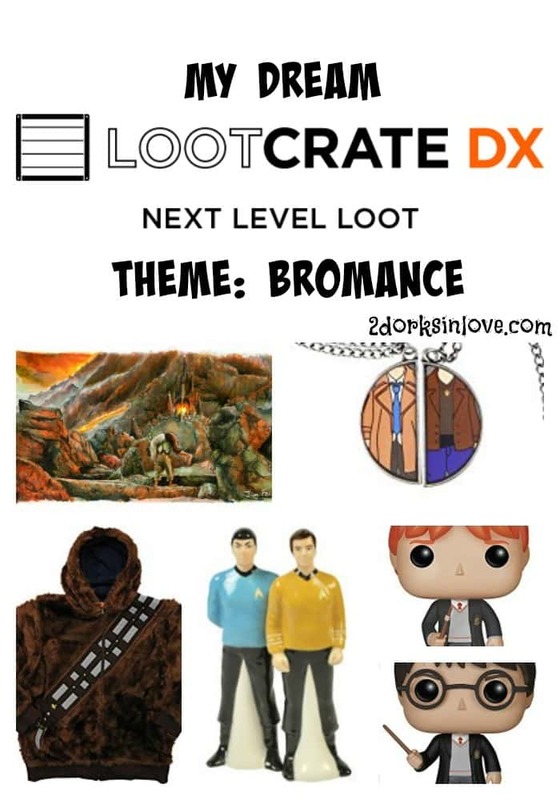 I think in a future post, I will explore the same for friends that are women and pass the Bechdel Test 🙂 For now, I present one version of my Dream Loot Crate with the theme of Bromance. They said I could make it big and crazy, so here we go. We are definitely Star Wars people in this household…daughter #2 can attest to that. I am finishing up a Star Wars kitchen (complete with wrapping the fridge with Han Solo in Carbonite) and she will have a Star Wars themed nursery. 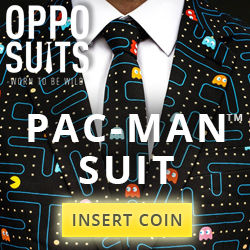 This is the first bromance that came to mind when I was designing my dream Loot Crate. Where there’s Han, there’s Chewbacca since they always have each other’s back. This interspecies pairing is one for the ages. Since I live in an area where it snows (sigh), this hoodie looks especially inviting. If you want an example of a loyal friend, Samwise Gamgee is tops in this department. Think about it; he basically went to hell (er….Mordor) and back to help his beloved friend Frodo. At one point when Frodo was struggling to go on under the influence of the Ring and wouldn’t let Sam take it, Sam carried him so he could still go forward. Always there for him. Always faithful. Beautifully captured in this print from Jimbeanus on Etsy. For me, Kirk and Spock’s relationship is captured in the scene from Star Trek II: The Wrath of Khan (and later, the roles were reversed in Star Trek Into Darkness). Spock had sacrificed himself and succumbed to radiation poisoning. Kirk tried to rush in to help his friend, but McCoy and Scotty held him back. They say their goodbyes with hands pressed to the glass, with Spock making the “Live Long and Prosper” sign. Remember them in happier times with this fun salt and pepper set. It’s even magnetic to help them stick together! Hermione was definitely a loyal friend in that trio, but to stick with the theme, I am focusing on Ron Weasley and Harry Potter. Their True Bromance status is confirmed during the Triwizard Tournament in Harry Potter and the Goblet of Fire. Harry has to rescue his most treasured person, which turns out to be Ron. I love Funko Pops! (who doesn’t ?!? ), so would include this duo in that form. Okay okay…I am definitely aware that some people think of them as Destiel. Whether it’s romantic or not, these two have been through a lot. After all, they have been to Heaven, Hell, Purgatory and through the Apocalypse. How many other characters in fandoms can say that? If you don’t want to use these as necklaces, they could be transformed into keychains or the like easily enough. What are your favorite geeky bromances? What would be in your Dream Loot Crate? Yes that would be awesome to have a Batman and Robin lego set in there or such. Yes! I love them too and a pillow/blanket fort would be so much fun. Castiel and Dean are my all time favorite. My favorite bromance right now is Poe Dameron / Finn :D!